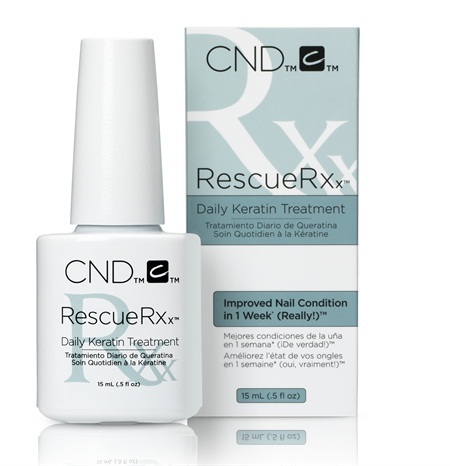 If you or your clients have weakened or damaged nails, CND’s new product, Rescue RXX might just save them. The new nail repair treatment is infused with keratin protein, jojoba oil, and sweet almond oil. The proteins in the treatment bond to the natural nail to strengthen and restore moisture. It also dramatically reduces peeling and white spots for healthier, stronger, and more beautiful nails. For best results, apply Rescue RXX to bare natural nails twice a day, massing into the entire nail, nail edge, and cuticle after a meticulous manicure. Once a thin layer is applied, you can send clients home with a bottle of their own (which has 160 applications per half once). Afterward, schedule a follow-up appointment to reassess nails to determine whether the treatment should continue or if they’re back in shape (sans delamination or surface spots) for color. You can add $15 to your basic manicure service when using this treatment. CND’s Rescue RXX will be available worldwide in March. For more information, visit www.cnd.com.